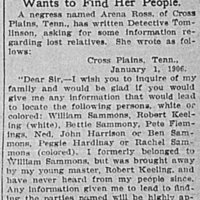 Mary Ann Brown searching for her husband, Israel Brown. 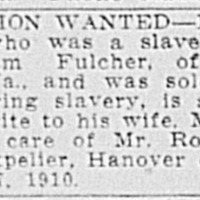 He belonged to William Fulcher. Sold in Richmond, VA during slavery. 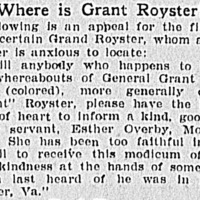 George Crawford searching for Mag and Merinda Crawford. 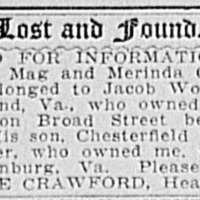 They belonged to Jacob Woodson, of Richmond, VA. Reward for information offered. Searching for former slaves of William W. Standley of Port Royal. They were "sold without owner's consent, 1859." 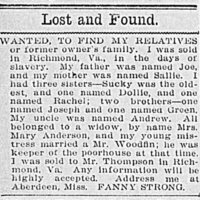 Fanny Strong was sold to a Mr. Thompson in Richmond, Virginia. Her parents were Joe and Sallie, siblings were Sucky, Dollie, Rachel, Joseph, and Green. 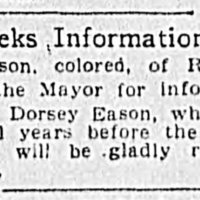 Eason wrote a letter to the mayor of Richmond, Virginia, in search of his brother, who was sold in Richmond several years before the Civil War.